Fabricio Coloccini has been out since February 24th, when he injured his back in the 4-2 win over Southampton at St. James’ Park, and he has missed the last 12 games. And after that game – who would have thought we would be in a relegation dog-fight with just three games to go? But there’s some good news from manager Alan Pardew today, that Colo should be ready to lead the lads in the last three games of the season, starting at Upton Park on Saturday. It seems that Yohan Cabaye has come under some criticism for his lack of leadership in the last two home game at St. Jame’s Park – and his future could even be up in the air in the summer. It will not be up in the air if Newcastle are relegated, that’s for sure, because he will be sold to the highest bidder. Captain Colo is a folk hero on Tyneside, and these last three games – if he is fit to play – could be the most important games he has ever played for Newcastle. And they could also be his last, if he gets his wish to leave Newcastle in the summer, and return to Argentina to be with his family. Colo has been a much bigger miss than i thought he would have been if i’m honest. He is key to us, when he plays and is in form the whole side do well, hopefully he can play the last 3 games and want to stay next year (very unlikely i know). If he goes we need to sign a good CB, somebody with a lot of experience (can still be young at 23-5) but needs experience and leadership. 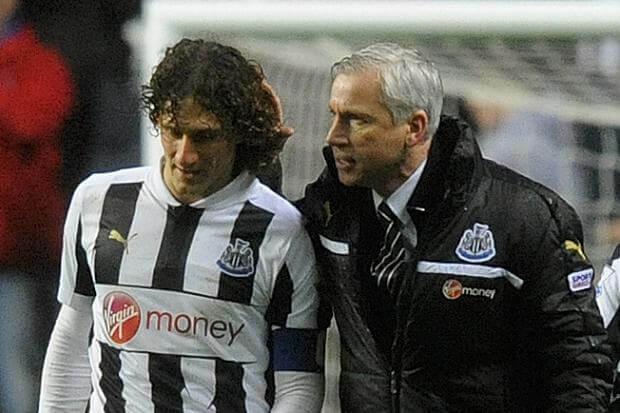 How long’s Colo been out .. and he’ll just pull on his shirt and be up to Prem pace … get real. I would say that willo is better in the air than saylor, fed up of staylors gungho tactics, is it a coincedence that we have been flooding in goals since willo was dropped. Do you know what guys, I’ve been optimistic throughout the past 2 years, not going to change now with 3 games to go. It’s been fairly cr*p all year, even more cr*p the past few weeks, but this is football and one game can change everything. 3 points this weekend of West Ham and we can push on. What’s the worst that can happen, spirits get even more trampled on? Only thing that can be worse than we feel right now is being relegated so might as well go down with a bang. It’s strained optimism, but optimism all the same. HWTL! I’ve been trying not to complain about it as you have a Phd in computer science,the site has clearly been hacked with all these pop ups I can’t even use my tablet anymore on here,could you at least post a link telling us ur doing something about it. Will be good to have Colo back, need him to sort out this backline. Would also play Harper this weekend, he is still good enough and Elliot has conceded a lot of goals in his few premier league games…. Don’t want to knock the lad, but his confidence will be shaken, and it may be better to bring in Harpers experience for the last few games and let Elliot regroup for next season. Lilongwe…Tough one with regards to Elliot or Harper. Not really a whole lot to chose between the two, so confidence has to be the main factor in who to play. Ibiza…. Ah but if pardew does keep us up then sods law dictates that he wont be sacked and we’ll be lumbered with the toad for another season and likely lose all our players and money. Relegation will rid us of pardew but then we’re in the championship. Damn one way and damn the other. Boom. Jail…Does your tablet use the android platform? Others with phones that use android, there appears to be an adblock available, not tested it as I only use a laptop for the site, but may be worth checking out. Give me a pint of your optimism – cos I aint got any after Saturday’s shambles. Rainrix…Sorry mate, the only “triumph” to be had this season is to stay up. Would anyone really take being in the championship without Pardew over being in the PL with him? Especially considering he will likely be watched extremely closely if he is given another shot at it? Charlie…Not going to lie, it’s taken a few days to be able to muster that up and it is forced optimism. I have just got to the point where I don’t see how being depressed about it is going to help at all. The manager, players and fans (like it or not) have to fight now. Pardew is clearly not going now, so we might as well give it a bloody good go. Ashley has dreamed up this stability philosophy probably looking at Ferguson at Man U,but please remember this immense football knowledge decided to downsize the squad before a EL campaign,so do not be surprised to see Pards at SJP no matter what division were in. Ibiza…. I don’t think anyone would take relegation again. Far too painful. I think most would swallow their hate for pardew if given the choice. i heard marveaux got into a fight with abeid. Don’t buy the argument that sacking Pardew is too much of a gamble. The real gamble is leaving him there because I can’t see a single shaft of light. I imagine we will lose at WH and probably against Arsenal. Makes the QPR match a must-win and against a relegated side that is such a random affair. If Wigan win this weekend I firmly believe we are down. Jamsha…Really? Seems to be off the same site I got my adblocker from. Isn’t android for mobile devices, not fixed lines? Jail… Silly me i forgot the elephant in the room that was ashley. 7 more years! Brendan rodgers would get less of a sentence for “masterminding” the massacre that happen on saturday. Everyone is getting very worried by the threat of relegation, and rightly so. But, the way I see it is that we are now in a mini league with Sunderland, Aston Villa and Wigan and Norwich have a point head start. We have 3 games that are no harder than the others. We have a minimum of 2 points head start over Wigan. If we can’t amass more points than at least one of those other teams during the last 3 games then we deserve to go down. I am confident that we will get 4 points from the 3 games. We just need to dust ourselves down and get positive again and worry about where our club is going and who is guiding it there in the summer. Remember, Moyes finished 5th in his first season at Everton and then scraped to safety in 17th the following season. jeff… Abeids at st Johnstone >_> ITK fail. This is a back 4 that’s played together, has the knowing of each other & has PL experience.Two UK on right side – 2 Argies on left. Gabby & HBA can terrify the opposition & attack is the best form of defence. Tiote & Cabaye know each other’s games & Cabs will actually have someone to pass too (RM, LM & 2 St’s) while Tiote will cover (hopefully) the back 4. Shola & Papiss up front. Willo can always punt hoofballs to shola who can knock em down for Cisse. Need 2 up front to make their defenders work – was none of that vs Liverpool. Hoping for something out of the game but not holding my breath! Ibiza, will u believe me now about Pardew ! Indian,why always with the negativity,is their no teams in ur homeland too disrespect. Never liked ur comments,pointless!!!!!!!!!! Munster…That he is not the best thing since sliced bread? Never doubted that. Honestly, even after this season, I will still hold reservations about him being as bad as many make out. I do accept he is far from perfect though and that a better manager would have likely coped much better. I still don’t hold him solely responsible for this season, there are loads of factors and Pardew isn’t big enough to have dealt with them all. Off to meetings, have a good one.